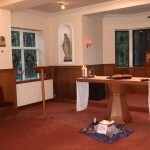 Life Ascending Spirituality in a parish group. 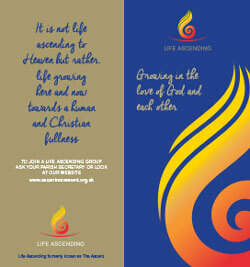 A Life Ascending group meeting celebrates both our mutual faith and the sharing of common experiences of life. It encourages friendship between retired men and women, stimulates thoughts and discussion and enables them to reflect on the purpose of their life. Life Ascending should not be seen as another Bible Study or Prayer Group, although a meeting will incorporate both as well as the celebration of our mutual faith and the sharing of common experiences of life. First of all, Spirituality: the call to every member is to a deepening of their own spiritual life, to see what God is asking of them and how He wants them to spend this time of retirement however long this may be. There is great peace in doing what we feel God wants us to be doing rather than what we think we should be doing. The spirituality of the second half of life requires that we learn to deal with the lessening of time; To live with a new intensity not less, To make every moment count. To understand that human fulfilment has something to do with knowing when to move on. To say goodbye to yesterday in order to enjoy today as we have never experienced it before. Age is the opportunity to be fully present wherever we are. The Word of God is at the heart of each meeting and by listening to His Words and reflecting on them, members seek to discover what God is saying to them at this moment in their lives. Members enjoy drawing prayerfully on the life of a saint, the teachings of the Church and spiritual works as valuable subjects for discussion. Special Masses, days of prayer and large events when members come together are always enriching occasions to encounter the vitality of Life Ascending and more fully share our love of God and each other. We thank you for counting on us to be the witnesses of your wisdom and tender love in today’s world. Through Mary and our friends in Heaven, we surrender ourselves to your love. While awaiting the blessed day when you will lavish happiness upon us. We offer you our lives for your Glory and for the Salvation of the world. You who love us now and forever Amen.